Is Mr. Toad about to drive out of Disney? It may be goodbye to Mr. Toad and hello to Winnie the Pooh and Buzz Lightyear at the Magic Kingdom. Disney officials are considering a number of changes to update their oldest Central Florida theme park, which is reaching the end of a 16-month celebration of its 25th anniversary. Among them is a likely but not yet firm plan to close Mr. Toad's Wild Ride -- a staple at the Magic Kingdom since its opening in 1971 -- and replace it with a ride based on Winnie the Pooh, which has seen a recent surge in popularity. More certain are plans to close Take Flight -- formerly Dreamflight, and before that, If You Had Wings -- in January to make way for Buzz Lightyear's Space Ranger Spin. The ride will let passengers use laser guns mounted to their spinning spaceships to help the Toy Story hero keep the universe safe. Also, the tiki birds of Tropical Serenade -- Disney's first audio-animatronic attraction -- have flown away for the winter. They will return next spring in The Enchanted Tiki Room -- Under New Management, a slightly campy show that pokes fun at the original, outdated version. The changes are part of Disney's ongoing effort to update or replace aging attractions while adding new rides, parades and shows aimed at different segments of the market. "We're always looking for ways to improve our guests' experiences," Disney spokesman Craig Dezern said. "With Buzz and the tiki birds, we're adding some really exceptional new attractions that will make a visit to a favorite park like the Magic Kingdom new again." The changes aren't welcome news to some Disney fans, though. Linda Buttery, an Orlando woman who estimates she has visited Walt Disney World at least 300 times, said she has fond memories of Mr. Toad's Wild Ride -- memories she looked forward to sharing with her 3-year-old son, Ryan. "I've had the opportunity to experience it and he should, too," she said. "There are so many changes going on -- sometimes it's good to see the same old things stay the same." But Daniel Bauer, former president of a local Disney fan club, is less nostalgic. "I think change is great, especially for a real Disney fan," Bauer said. "When you've seen the same old show for so long, something new is always exciting." -- Assuming the project gets a go-ahead -- something insiders say hasn't yet happened -- Mr. Toad will take his last wild ride sometime late next year. The three-minute ride, based on a 1949 Disney film called The Adventures of Ichabod and Mr. Toad -- which is based on the Kenneth Grahame novel The Wind in the Willows -- takes visitors down the road to Nowhere in Particular. Along the way, they zip through dark rooms, crash through a fireplace and face a collision with a locomotive. Although the ride is popular and almost always has long lines, some parents have complained that it is too scary for small children, and some visitors have complained that it is outdated and technologically inferior to other Disney rides. The Winnie the Pooh ride would solve both those problems. Visitors would board "hunny pots" for a trip through Pooh's Hundred Acre Woods. Along the way, they would encounter such characters as Pooh, Piglet and Tigger. The ride would open in late 1999. -- Take Flight, a slow-moving look at the history of aviation -- sponsored in the past by Delta and Eastern airlines -- is to close in January and reopen in December. Using technology similar to that in Frontierland's shooting gallery -- pulses of light shot from the guns cause objects to fall or explode -- passengers will help Buzz battle the evil Emperor Zurg, who is threatening the world's toy population by trying to steal the planet's battery supply. At the end of the ride, space rangers will learn their score -- a gimmick expected to guarantee heavy repeat visitation. -- The tiki birds, which were introduced at Disneyland in 1963 and have been at the Magic Kingdom from the start, have stopped chirping while the show adds several new characters, new music and a new story line. During the pre-show, the audience will learn that talent agents William and Morris have rewarded their star winged clients -- Zazu from The Lion King and Iago from Aladdin -- by letting them take over management of the tiki bird show. Iago keeps insulting the show, despite Zazu's warnings that his nastiness will anger Uhoa, the tiki goddess of disaster. 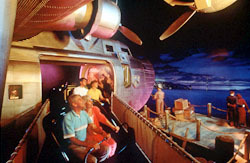 Take Flight, a trip through the history of aviation, will soar no more at the Magic Kingdom. It will board its last passengers in January and then close to make way for Buzz Lightyear's Space Ranger Spin. PHOTO FROM THE WALT DISNEY CO.
1983: The swan boats that dock near Cinderella Castle close. 1986: The Country Bear Jamboree in Frontierland gets a new show: "The Country Bear Vacation Hoe-Down." The show eventually returns to its original format. 1993: The Carousel of Progress, a decades-old look at technology in 20th century life, is updated. The Dumbo ride is replaced with a new version to accommodate more passengers. 1994: Snow White's Adventures is revamped to reduce the fright factor. On Labor Day, 20,000 Leagues Under the Sea closes. Park officials first said it would reopen, then said that would be too expensive. Now they aren't commenting. 1995: Tomorrowland gets a makeover, the first major renovation of a Magic Kingdom area. The new Tomorrowland features almost all new or updated rides. Among the changes: Mission to Mars, originally Flight to the Moon, is replaced with the Extraterrorestrial Alien Encounter. 1997: Tropical Serenade, starring the tiki birds, closes for an overhaul. It is to reopen next spring. The Swiss Family Treehouse closes for a makeover with plans to reopen in June. All content ©1997 Orlando Sentinel. Republished with permission.